Hong Kong Airport has been No.1 in the world since 1996 in terms of international air cargo throughput. Reports suggest it cost $20bn. Two islands were flattened to form roughly a quarter of the new island. 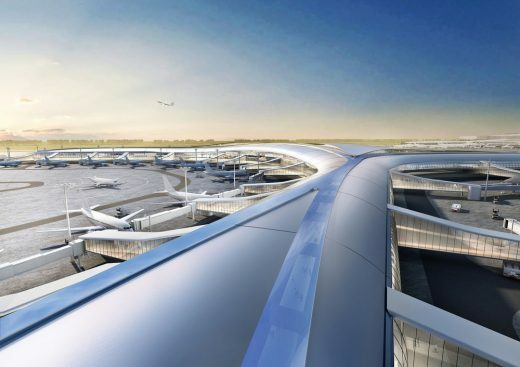 Norman Foster built on his experience of Stansted, the first airport by Foster & Partners, in England. Stansted had a great concept sketch by Norman with two parallel horizontal lines and arrows showing ingress and egress. The space felt airy upon completion with great views of the aircraft. Since then it has sadly been filled with retail spoiling the volume and feelings of spaciousness. Chep Lap Kok Airport however still feels airy despite significant retail element: maybe this is a result of knowledge gained from the Stansted experience or perhaps due to simple factors such as the greater height from floor to soffit. The plan is frequently shown and forms a simple diagram of a line with forks at each end and airport bays all around save the entry of course. The Section is also simple: repetitive shallow vaults use similar light ‘diffusers’ as at Stansted Airport. Materials and surfaces are generally grey, typical Foster & Partners style! Hong Kong International Airport is reputedly the world’s largest at approx. 550,000 sqm.